Ebola was still at its peak when I started my degree. I was excited about starting university, hoping to make friends and have a lot of fun. But Ebola quickly dashed my hopes. The University of Makeni had brought in strict rules: no hugging, no touching, no shaking of hands, regular temperature checks and hand washing. Students were afraid of each other. New cases were being reported every day, even among colleagues and lecturers on campus. It was a lonely, dispiriting time. I was standing on campus one morning when I saw her. At first, I thought she was an illusion! She was walking to class dressed in a red blouse and black shoes with her natural hair in plaits. I couldn’t stop looking at her – the three-hour lecture passed in what felt like 30 minutes. When class finished, I sprang to my feet and approached her. She told me her name, we hurriedly exchanged numbers and she disappeared into the crowd. It was hard to start anything on campus. Everybody was watching, ready to say: ‘This is Ebola! Be careful.’ And that fear was in us too. So we started to communicate by phone, using WhatsApp, text messages and calling. It started off slowly. Getting acquainted was hard without being able to touch. I didn’t even know where she lived. But as time went on, we became more emotionally connected. For six months, eighteen days and eight hours, our relationship was only on the phone. Endless WhatsApping continued till late at night. An hour without a message made me sick with anxiety! But it could be fun. She would tease me, asking, ‘have you had breakfast?’ I would say no. ‘OK I will WhatsApp you tea.’ It felt like we were living together. 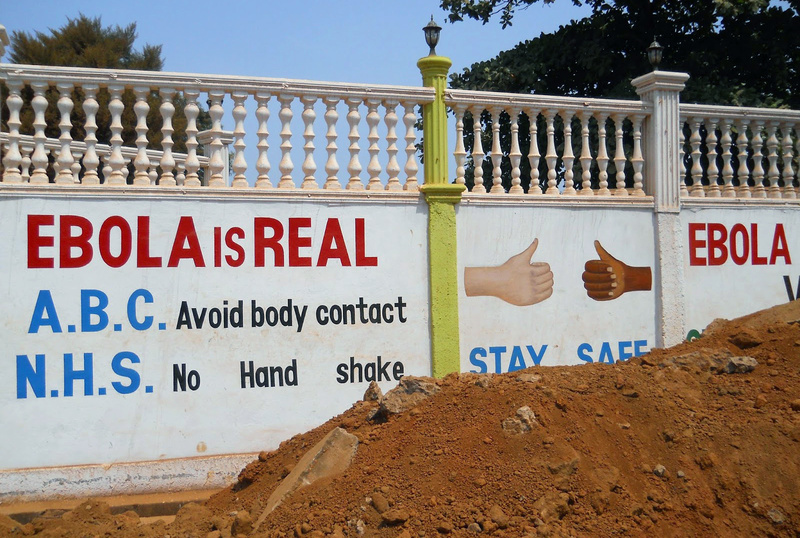 Sierra Leone’s 42-day countdown to being Ebola-free sparked renewed hope. I counted down every day with many others, and when the final day came, we arranged to meet at 7pm. The preparation on both sides was intense, I must confess. I checked my jacket again and again. When I finally got dressed, I was wearing black shoes and a tuxedo with a black bow-tie. I’d asked her to wear the same clothes as the day I saw her – and she’d told me to dress for a job interview. As I sat down, somebody tapped me on my shoulder. She said, ‘You meet the requirements for the job!’ She beamed, radiant with joy. I returned her smile and we hugged for more than five minutes. I don’t know who finally released the other. We looked into each other’s eyes for a considerable amount of time, inhaled deeply together and breathed out. It was intense – I was shivering, gasping for air. Then finally we kissed. She spoke first: ‘I missed you.’ We talked for a long time. We spent half of the night out in Makeni, with the blaring of motorbike taxi horns, the shouts of ‘Ebola Don Don!’ (Ebola is over!). Then, holding hands tightly, we walked three kilometres to my house where we sat and drank a toast to the end of Ebola, exams, and to our new relationship. We still talk about the hug. To this day, it lingers in our minds. We say it was so special that it will be more important than our wedding day. It will remain in our hearts forever.